In 2012, healthcare spending in the United States hit $2.6 trillion, almost 10 times the $256 billion that was spent 30 years ago. Approximately half of this spending goes toward hospital care and clinical services. It is not uncommon for 40 percent of the providing care costs to be spent on supply chain expenses. Inventory management is a complex process. It includes placing electronic orders, matching contract pricing to order pricing, maintaining current and clean data and validating trading partner and product information. Additionally, inventory management is critical when it comes to developing better end-to-end visibility for all health care products, supplies and devices. When demand and inventory are better managed, we can see how inventory management systems save health care companies money. These savings can be anywhere from 6 to 13.5 percent of total health care costs. One of the best parts about pursuing lean management methods, such as improved inventory management, is that health care organizations don’t have to face layoffs and staff reductions. They get to keep their valuable staff members while improving the quality of patient care. Strategic alliances and supplier partnerships can be key for getting consistent product prices. It is important to keep in mind that a supplier partnership is not a genuine partnership but is instead a contract that details each company’s responsibilities. One of the latest health care regulations are UDIs. UDIs make it easier, and as such, more accurate to capture data on particular items used at the point of patient care. In turn, providers have an easier time calculating comprehensive procedure expenses, increasing billing accuracy, and improving inventory management. Suppliers must have information about the demands for their products. Currently, most manufacturers do not have much insight into their product once it’s out in the field. For any business, it is key to have a projected plan for the future in order to budget appropriately. For inventory management, companies must have the technology to forecast production, procurement and logistics. A shared infrastructure is key for health care systems. Companies can focus on creating heightened visibility initially and then move on to tapping into aggregated data sources for better forecasting and demand planning. The Institute of Business Forecast and Planning has a couple recommended techniques for measuring forecasting advantages. The first method is to determine how much would have been lost if the forecast was inaccurate. The second method is to determine how much would have been saved or gained through heightened forecasts. 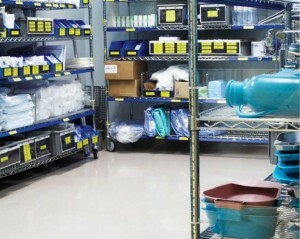 As provider organizations work to meet new business requirements, they should view inventory management as the backbone. This critical technology infrastructure component assists with capturing and sharing much-needed data. For example, a company that captures data pertaining to medical products and devices that are used during patient procedures can use this data to produce the same information in additional locations, such as the electronic health record. As such, a one-time data capture for multiple uses is much more efficient than current data capture methods. Don Amato is Vice-President, Sales of Chicago Tag & Label in Libertyville, IL. Chicago Tag & Label manufactures form labels, labels and tags that deliver solutions to a broad range of industries including retail, industrial, manufacturing, distribution and medical environments.